Semi-fitted top has round neck with stand-up band, diagonal front seam with cascading drape, angled pocket extending into hem. Long or short sleeves versions. Stitched hems. 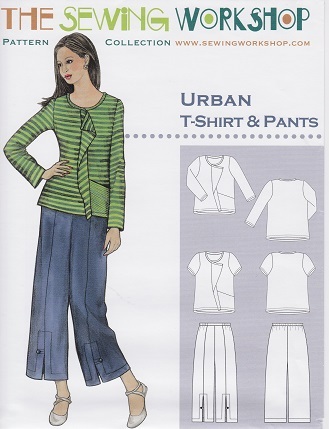 Pants cropped straight-leg pants has center front seam with faced vent and button and loop detail, no side seam, flat waisband in front with elastic sides and back.